Just as a matter of interest: the spines are the leaves and the green parts which look like leaves, are the stems. Applies to all cacti even the what-used-to-be-called Zygocactus that soft rainforest cactus which flowers in winter. They have no spines but the flat 'leaves' must be stems since flowers don't happen on the ends of leaves. The Nopales tasted rather 'lemony' (to be kind) aka 'acidic' and had enough spines to make it mandatory to remove them before eating. Easiest way to cook some for the first time is to slice it bean like and fry it up with your bacon and eggs. Very pleasant tangy slightly lemony taste. The mucilaginous aspect is fried out. yes that is how we cook ours - bacon eggs and fried beans yum ! I have a fairly good collection of opuntia, including the only variety ever produced by Luther burbanks for fruit quality ( the others were bred as cattle fodder, and are spineless). I have O. Engelmanii, O. Linguiformis, O. Gigantea, as well as the burbanks and torrance 1. The Americans have bred a yellow fruiting variety that is seedless. In Mexico, the fruit are known as Tuna and are graded by colour ( Tuna blanca, Tuna Verde, Tuna Roja). The green fleshed types are rated the highest. They are all considered inferior to columnar cereus fruits, especially Stenocereus queretaroensis and Stencoereus gummosus. Cereus peruvianus is a good fruit too, I rate it over prickly pear. Have never tried nopales, supposedly they taste like green beans mixed with asparagus. Your collection is more for the fruit DM? They would be interesting to try. The one I grow is a (mainly) thornless Nopales for pad eating. The fruit proved worthless. I know the fruits are grown commercially for the Melbourne market and have been for decades. I suspect that it was the Southern Italians who embraced the fruits' delights (as they are also invasive in Italy)and before gentrification the inner city suburbs of Carlton, Fitzroy, et al all had many Prickly Pear rising above their fence lines...as well as figs and grape vines. They are a Italian backyard garden standard. you can also see the same around Brisbane...New Farm, for instance. But the Nopales weren't sold or -- as far as I recall -- eaten. Example: Lizio's Prickly Pear and Cherry Orchard. Priced around $1 each for fruits. They're not a fresh eating out of hand fruit. The seeds are insanely hard, you could probably fill shotgun shells with then. 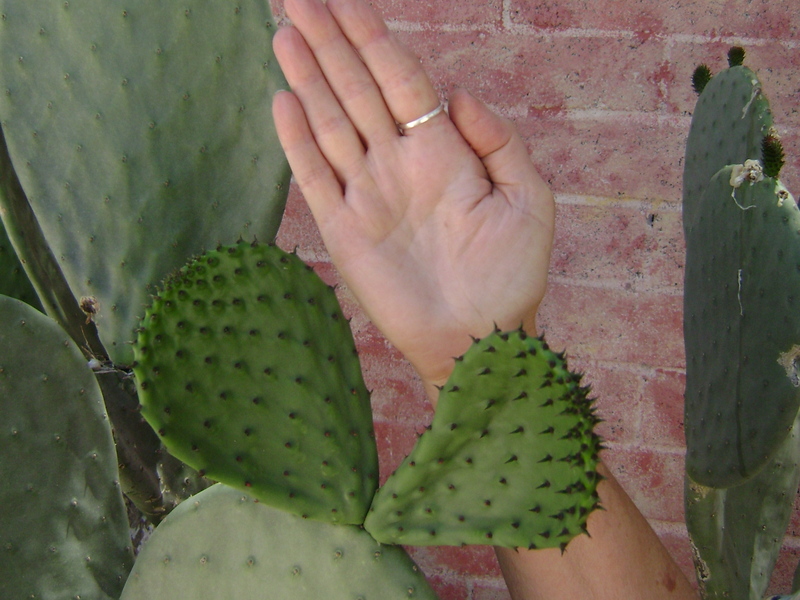 People have been hospitalised with constipation from eating too many prickly pear seeds. The best way to deal with them is by using a chef's blow torch. Just cook off all the hairs ( glochids) while the fruit is still on the plant. They're best made into syrups/jellies/candies. Prickly Pear fruit jam is sensational. It has so much pectin it's tough to spread and kind of rolls up chasing the knife. opuntia is probably the most useful plant in existence....it's actually amazing how many uses there are for opuntia. You can even purify water with the pads. They are spectacularly invasive in Australia and were an ecological disaster until the introduction of the cactoblastis cactorum moth, which sounds like a spell from the Harry Potter films, but absolutely decimated the Australian population of opuntia. Ccatoblastis cactorum will kill your dragonfruit, too. I was driving clients around Kenmore today and saw a big stand of cactus. As in Opuntia. Bit surprising in suburbia these days. Since I now have around 10 Prickly Pears growing in a soon-to-be succulent forest, I am appreciating the ready harvest and the increasing number of opportunities to experiment in the kitchen. Last night i made avery quick Nopal and Choko salsa which I enjoyed immensely. Equal quantities of Nopales (Prickly pear paddles) and very young chokoes. Chop raw Nopales into short narrow lengths and score the chokoes with a fork before doing the same. Toss with apple cider vinegar; chopped spring onions, smashed garlic and chilli (if you like) and a slurp of olive oil (if your preference). Dash of salt and fresh ground pepper. This refreshing salsa offers a crisp tasty lemony hit. You could add herbs if you want...but simple works. Nopales are one of very low calorie vegetables. 100 g of fresh leaves carry just 16 calories. Nonetheless, its modified leaves (paddles) have many vital phytochemicals, fiber, anti-oxidants, vitamins, and minerals that can immensely benefit health. The succulent paddles are rich sources of dietary fiber, especially non-carbohydrate polysaccharides, such aspectin, mucilage and hemicellulose. Together, these substances help bring reduction in body weight, LDL-cholesterol, and blood sugar levels. This rich fiber and mucilaginous content in cactus pads aid in smooth passage of digested food particles through the gut and help relieve constipation problems. In addition, the juice extracted from the noples has been suggested to have immune-booster, and anti-inflammatory properties. Cactus pads feature moderate amounts of vitamin A with 100 g fresh pads carrying about 457 IU of vitamin A, and 250 µg of ß-carotene. ß-carotene converted into vitamin-A inside the body. Studies found that vitamin A and flavonoid compounds in vegetables help protect from skin, lung and oral cavity cancers. Further, nopal pads contain small levels of B-complex group of vitamins such as thiamin, riboflavin, niacin, vitamin B-6 (pyridoxine), and pantothenic acid. These vitamins are essential for optimum cellular enzymatic and metabolic functions inside the human body. Fresh pads contain average levels of vitamin-C. 100 g provides 9.3 mg or 15% of this vitamin. Vitamin C is a water-soluble, natural anti-oxidant, which helps the body protect from scurvy and offer resistance against infectious agents (boost immunity), and help scavenge harmful, pro-inflammatory free radicals from the body. Why do you prick your choko before cutting Dave?